The bleaching of coral reefs is once again making headlines. Reefs across the tropical Pacific, including the Great Barrier Reef and now reefs in the Indian Ocean, are turning white due to warmer than usual sea temperatures as a result of climate change and the current El Niño. This may be the beginning of a series of mass bleaching events occurring at a global scale, similar to those observed in 1998, 2005, and 2010. Caribbean coral reefs may be the next to experience extensive bleaching, starting at the end of the region’s summer (~August 2016). How coral communities recover from the aftermath of bleaching events is a key question concerning marine scientists and managers as it will determine the survival of coral reefs on an increasingly warming planet. When sea surface temperatures rise above the normal high for the year, it stresses corals causing them to expel the colorful algae that live inside the corals’ tissue and which provide the corals with their brilliant color and most of their energy needs. Bleached corals are weak and the longer they remain in this state, the more susceptible they become to infectious diseases and vulnerable to partial or complete mortality. 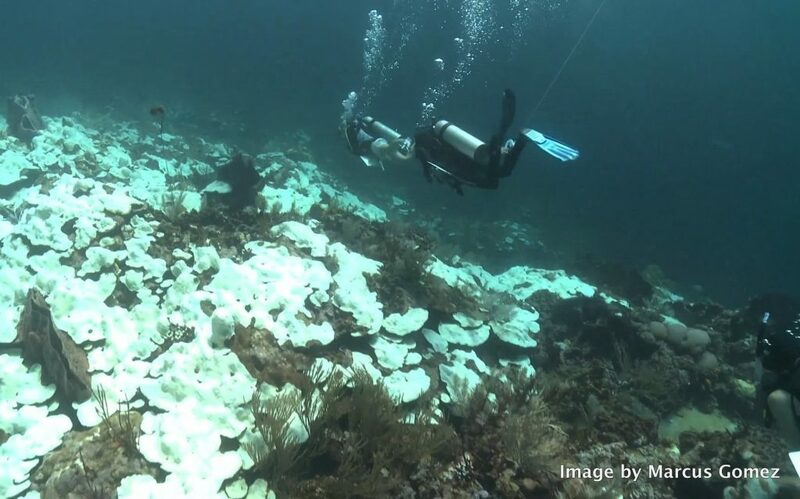 Severe bleaching events often lead to significant decline in coral “cover” – the fraction of the reef covered by living corals — and changes in the average colony size. For instance, the average colony size declines as a result of partial mortality or fragmentation. Considering that larger corals tend to have greater reproductive output, a decline in abundance and mean size of coral colonies can greatly slow down the ability of the corals to reproduce, regrow, and thus recover following disturbances such as bleaching. After witnessing the bleaching among the coral reefs that surround my home island of Tobago back in 2010, I decided to dedicate my Master’s thesis to studying the impact and recovery of these coral communities. With Simon Donner from the University of British Columbia and Jahson Alemu from the Trinidad and Tobago’s Institute of Marine Affairs, I examined changes in coral demographics over time (2010-2013) across three near-shore reef systems with different proximity to urban land. In addition, we tallied the juvenile corals at each reef, as their abundances are indicative of different species’ ability to reproduce sexually and survive. We also assessed sediment deposition and composition at each site using simple PVC pipe traps, as high levels of sedimentation are known to affect the growth stages in a coral’s life cycle. This study, recently published in Marine Pollution Bulletin, found that some coral species across Tobago were particularly susceptible to the 2010 heat stress event, as their abundance and mean colony size declined. However, the cover and size distribution of most corals were not significantly altered by the bleaching event. The lack of a statistically significant response is likely due to pre-bleaching coral cover already being quite low because of longstanding local disturbances in Tobago. Additionally, we found a low density of sexually produced juveniles, indicating that successful “recruitment,” (i.e., juvenile survival) is already low on Tobago’s reefs. This was especially the case among key reef-building species, like the Caribbean boulder star coral (Orbicella annularis) and brain corals (e.g., Diploria strigosa), which can grow to large sizes and tend to contribute the most to the reef structure. While sedimentation rates in this study were found to be below levels considered harmful to corals, our monitoring campaign was only a limited snapshot from the end of the dry season of 2013. A sediment accumulation profile that covers both the dry and rainy seasons would be necessary to capture the full range of sedimentation rates experienced at the different sites. 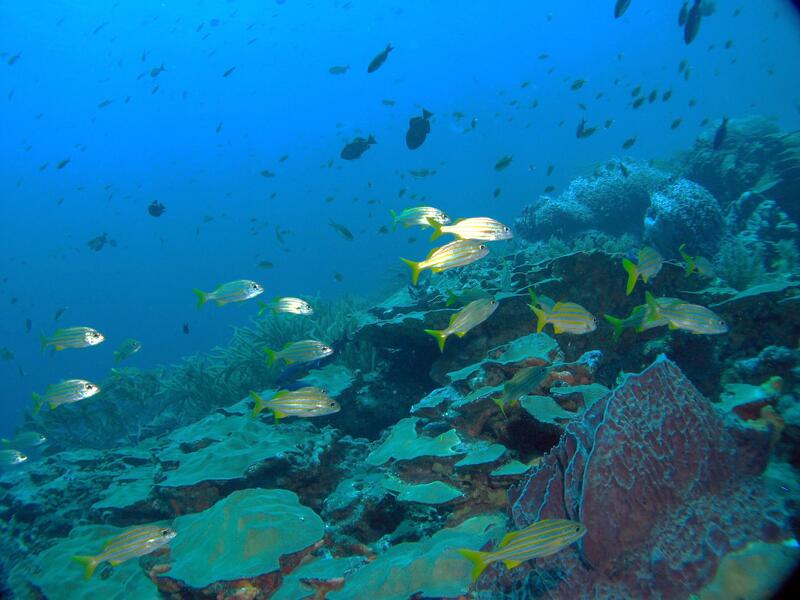 Our findings suggest it is likely that Tobago’s coral community will continue to be dominated by small colonies. Such a demographic shift would have implications on the diversity and reproductive output of coral communities, as it would leave “weedy” coral species which are more naturally fecund to become dominant. 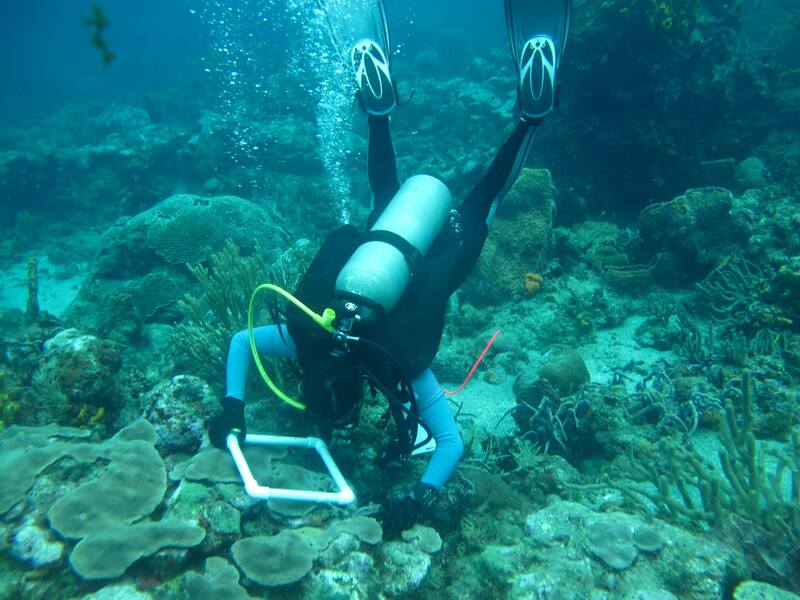 While a shift towards more resilient weedy species means that corals may persist in Tobago, it is possible that these species may not grow at the rate, and in the structure, necessary to maintain the framework and function of the reefs. The maintenance of reef-building taxa, like Orbicella annularis, Siderastrea sidereal, and Diploria strigosa, should therefore be a key conservation priority across Tobago’s reefs. The challenge is that as the oceans continue to warm, the rate of post-bleaching recovery among Tobago’s corals may become much longer than the time between severe heat stress events. Tobago’s population relies heavily on its fringing coral reefs for income from tourism and inshore fisheries, and also for protection from wave action and storms. In order to safeguard these ecosystem services, it is essential to increase the opportunities for successful recruitment among reef building coral species. It is paramount that local coastal ecosystem management efforts target increasing herbivory and reducing sedimentation and nutrient enrichment among the reefs still feature sufficient coral cover. This entry was posted in Dispatches, Features, Science by Editor. Bookmark the permalink.